North and South Korea in April will have the first meeting between their leaders since 2007 at the border village of Panmunjom. Seoul/Washington: South Korean President Moon Jae-in said on Wednesday sanctions on North Korea will not be eased for the sake of a summit between the two sides as Chinese state media repeated Beijing's line that talks are the only way to end the nuclear standoff. 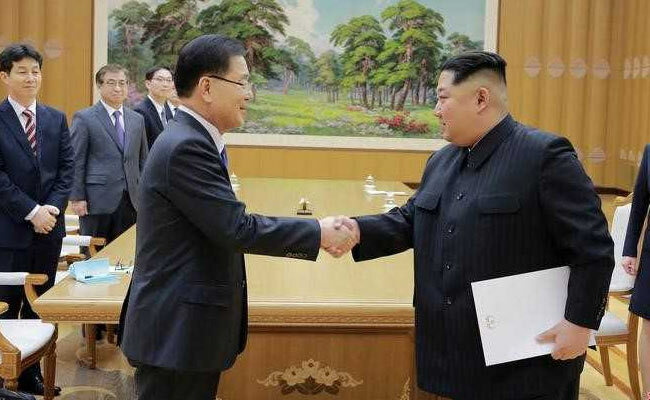 South Korean officials met North Korean leader Kim Jong Un on Monday in the first such encounter of its kind and said he had expressed his willingness to denuclearise if his country's security is assured. And US President Donald Trump said North Korea seems "sincere" in its apparent willingness to suspend nuclear tests if it holds denuclearisation talks with the United States. Tensions rose to the highest level in years over North Korea's nuclear and missile programmes, which it pursues in defiance of UN Security Council resolutions, with shrill, bellicose rhetoric coming from both Kim Jong Un and Trump. North Korea has boasted of its plans to develop a nuclear-tipped missile capable of reaching the mainland United States. But fears of all-out war eased last month, coinciding with North Korea's participation in the Winter Olympics in the South. "From looking at the news or Twitter, I believe President Trump is positive about the results of the North Korea visit (by South Korean officials)," Moon told political party leaders. "However, as this is just the beginning, I believe we are not at a situation yet where we can be optimistic." "Just because there are talks ongoing between North and South Korea doesn't mean international sanctions can be eased," said Moon. "There cannot be an arbitrary easing of sanctions; we do not wish to do that and I tell you now it is impossible." South Korea's goal was the denuclearisation of North Korea, nothing less, said Moon in comments distributed by the Blue House. "We cannot have things like the prevention of nuclear proliferation or a moratorium as a final goal," said Moon. North and South Korea are technically still at war because their 1950-53 conflict ended in a truce, not a peace treaty. The North defends its weapons programmes as necessary to counter US aggression. The South hosts 28,500 U.S. troops, a legacy of the war. North and South next month will have the first meeting between their leaders since 2007 at the border village of Panmunjom, Chung Eui-yong, head of the South Korean delegation, said on Tuesday. Leaders around the world have also met the apparent breakthrough with guarded optimism, wary of repeating past negotiations that failed to prevent Pyongyang from developing nuclear weapons and intercontinental ballistic missiles. On-again off-again "six-party" talks, grouping the two Koreas, Japan, Russia and the United States and hosted by China, ended in failure in 2009, with North Korea criticising US aggression. South Korean officials who met the North Korean leader will leave for Washington on Thursday. Chung said he had a verbal message from Kim Jong Un that he will relay to US officials but it was unclear whether he would meet Trump. After returning from the United States, Chung will visit China and Russia, while Suh Hoon, the head of South Korea's intelligence agency, will head to Japan to brief officials. Trump told reporters in the Oval Office the United States had "come a long way, at least rhetorically" with North Korea and "statements coming out of South Korea and North Korea have been very positive". Asked if he had any preconditions for talks, Trump said: "I don't want to talk about it. We're going to see what happens." US Vice President Mike Pence said the United States would continue to apply "maximum pressure" on North Korea and that all options were "on the table" until Washington sees evidence Pyongyang is taking steps towards denuclearisation. Keeping up the pressure, the U.S. State Department said on Tuesday it had determined Pyongyang used the chemical warfare agent VX to assassinate Kim Jong Un's half-brother in Malaysia in 2017 and had imposed sanctions in response. This information had already come out in court in Malaysia. Chinese state-run tabloid the Global Times published an editorial saying the Korean nuclear issue cannot be solved without China, Russia and the UN Security Council. Markets reacted positively to the prospect of talks and a lowering in geopolitical tensions. Shares in South Korean companies with exposure to North Korea rallied on signs of a thaw in relations, while companies in the defence market saw their shares dip.